Opinion: Star Wars films may be oversaturating the market, writes Ani Bundel. So why doesn't this problem to plague Disney’s other major franchise, Marvel? This story is one we’ve basically already seen.Jonathan Olley / Lucasfilm Ltd.
“Solo: A Star Wars Story” astonished over Memorial Day weekend by being the first of the Lucasfilm releases this decade to tank (relative to expectations) at the box office. The three-day opening weekend receipts came in at around $84 million, down nearly $100 million from the initial estimates. One reason being thrown around is that the release date was too close to December’s release of “The Last Jedi.” Two Star Wars films in the space of six months is simply too many, some critics theorized. And, as Deadline reported, some movie distributers are feeling Lucasfilm is “over-saturating the market.” (Even franchise star Mark Hamill is worried about it.) But if that's true, how does Marvel manage to release three films a year, and bring in hit after hit? Two Star Wars films in the space of six months is simply too many, some critics theorized. But if that's true, how does Marvel manage to release three films a year? When “Solo: A Star Wars Story” tickets first became available during the fan-created Star Wars holiday of May the 4th, pre-sales were brisk. In fact, sales were good enough that long-term estimates for opening weekend soared all the way $170 million, which would break the box office record for Memorial Day weekend, currently held by “Pirates of the Caribbean 3” with $139 million, and put “Solo” in the same category as other Star Wars releases, all of which have easily smashed the $150 million mark upon their first weekend. (The only other 2018 films to break $100 million in the first weekend are “Black Panther,” “Avengers: Infinity War,” and “Deadpool 2.”) All the malaise surrounding the film’s production drama seemed to be in the past. Audiences just didn’t seem to be interested in seeing two Star Wars films this close together. Not to mention how crowded the last couple of weeks have been for superhero fans. Audiences just didn’t seem to be interested in seeing two Star Wars films this close together. Not to mention how crowded the last couple of weeks have been for superhero fans, what with “Avengers: Infinity War” arriving at the end of April and “Deadpool 2” premiering on May 17. Plus, the highly anticipated “Oceans 8” premieres on June 8, meaning “Solo” is unlikely to have a long tail at the box office. Frustratingly, at least for executives, this problem doesn’t seem to plague Disney’s other major franchise, Marvel. “Black Panther,” for instance, arrived February 16, and “Avengers: Infinity War” arrived April 27, barely eight weeks apart. Audiences opened their hearts and wallets to both. What does the Marvel universe have that Lucasfilm does not? Simply put, the Marvel fan base supports multiple films a year because it is kept interested by a wide variety of films. Look at its line up over the last two years. Starting in May of 2017, Disney released “Guardians of the Galaxy 2” (opening weekend: $146 million), followed by “Spider-Man: Homecoming” ($117 million) and “Thor: Ragnarok” ($122 million). This year they've given us “Black Panther” ($202 million) and “Avengers: Infinity War” ($257 million), with “Ant-Man & The Wasp” to come on July 6th. In the space of a 12-month span, they premiered five films all of which crossed the $100 million mark easily. And yet, while connected to the Marvel Cinematic Universe (MCU) in various ways, all six of these films are different. This is, ideally, what the "franchise universe" idea is supposed to do. It gives the studio a way to release films of all different stripes as sequels to one another, even though they’re all completely different, and most star different casts. 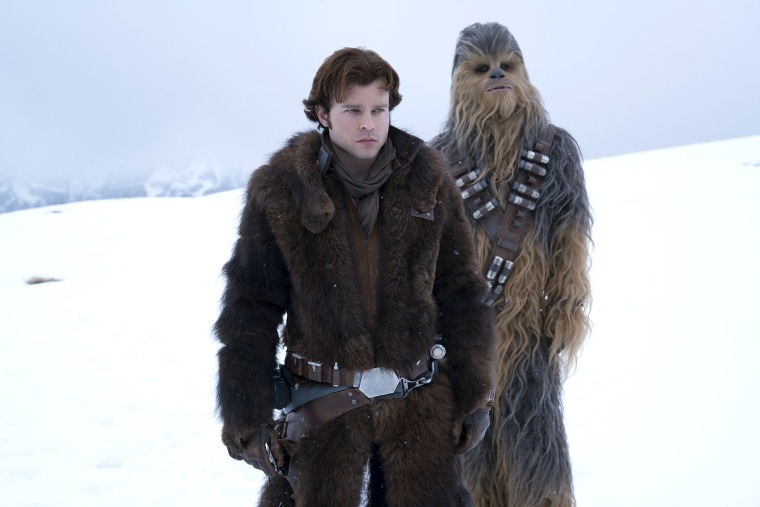 Ron Howard did his best, but “Solo” ultimately does not feel like a different kind of Star Wars movie. Lucasfilm and the Star Wars franchise could support two to three films a year, Marvel style, if they trusted themselves to write completely new material. Instead, they just greenlit a film about Boba Fett, which is essentially exactly like greenlighting a standalone film about Han Solo, but with a completely uninteresting main character. There is talk bandied about that come 2020, new trilogies will arrive that don’t involve the Skywalker saga, both on the big screen and for TV. While new mediums are good, viewers have been exploring the same galaxy since 1977. Revisiting this nostalgic if well-traveled turf may work once a year; to try more than that is simply foolish. Until Lucasfilm realizes this, there will likely be a lot more disappointing numbers at the box office ahead.